At the San Francisco County Jail, a voluntary horticulture program is changing prisoner attitudes. Part of the compound has been converted to a flower and vegetable garden, and the harvest is donated to community food banks. 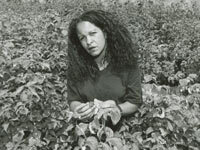 The successful gardening program, created by Catherine Sneed, has instilled in many prisoners a new sense of self-worth, respect for life and connection to the community. Outside of the jail, the program is blossoming into a network of community and school gardens. Ex-prisoners, business people, students, gardeners, Whites, Latinos, and African-Americans come together to work and create a place that is beautiful, functional and safe. Besides showing other institutions a model program, the film presents a powerful argument for rehabilitation that is practical and inspirational. "This inspiring program lends an optimistic perspective to prison rehabilitation." "An outstanding documentary that says a lot about spirit, hope, and love in a place where you might not expect it. Highly recommended. Editor's Choice." "An inspiring, award-winning video documentary... We highly encourage you to recommend this fabulous film to your local officials and prison administrators." "Inspired work combining counseling, gardening, and ecology in a jail environment... this film has lessons for everyone who lives on this planet."